For twenty-two years, the Mattie Kelly Arts Foundation (MKAF) has benefited Destin, Florida, with educational and cultural programs that bring the arts to children and adults. Its namesake and matriarch, Mattie May Kelly, was known for making a difference long before that. 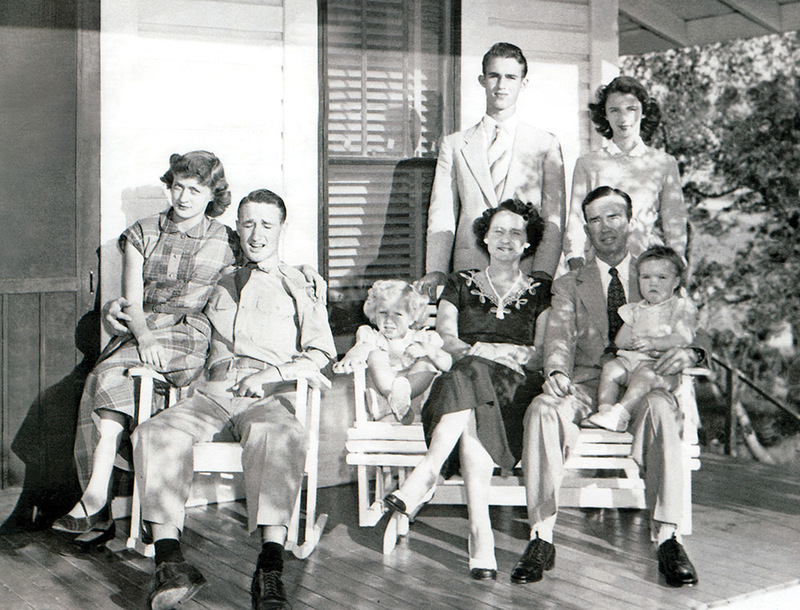 She and her husband, Coleman Kelly, moved to Destin in 1935 to start a turpentine farm and launch a charter boat, creating jobs and income that helped kick-start the area’s growth. Not only was Kelly a philanthropist who made generous contributions to arts organizations in the area, she was also a poet, a musician, and a composer. Today, thanks in great part to Kelly’s donation of fifty-two acres of land that is now home to the Mattie Kelly Cultural Arts Village, MKAF carries on her legacy. The foundation supports art of all types through its independent, nonprofit community outreach programs and events that are open to the public. 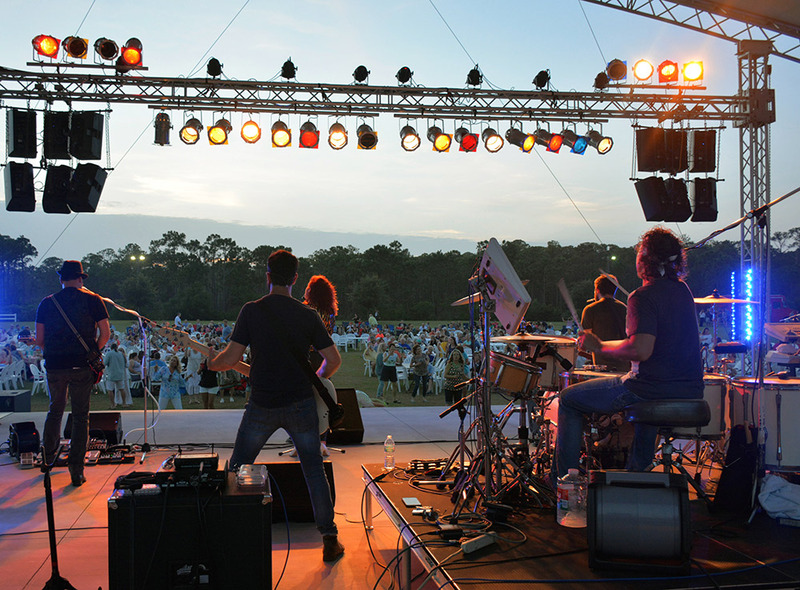 Its team of dedicated staff, volunteers, and board members work year-round to bring artists, performers, and events to the Emerald Coast. VIE caught up with the staff of MKAF to learn more. VIE: Can you tell us a little more about the history and mission of the foundation? Marcia Hull, CEO: The Mattie Kelly Arts Foundation was established in 1995 on the cultural, educational, and spiritual beliefs of the late Destin matriarch, Mattie Kelly. Fast-forward from our humble beginnings in 1995 to today and the organization has had the support of over 150 local business leaders dedicated to bringing their talents and treasures to actively serve on the board of directors. We currently have 300 annual members and 250 annual volunteers, and we’ve delivered twenty-two seasons of performing and visual art events, including community outreach programs in seventy schools and United Way agencies and numerous military and veteran warrior organizations. VIE: How does one become a member of MKAF? VIE: What makes you so passionate about the arts? MH: My parents introduced me at a young, impressionable age to a world of arts and culture. Whether it was taking tap dance, ballet, or piano lessons, enjoying cultural experiences such as seeing Carol Channing in Hello, Dolly! on the Broadway stage, ballerinas at the New York Lincoln Center, or performances at Radio City Music Hall, or appreciating the visual arts at such fine art museums as the Getty Museum or the Los Angeles Metropolitan Museum of Art, it allowed me to find my voice. Art has always been in my soul, and my ministry for the past nineteen years is Mattie Kelly Arts Foundation. Although we may have a small staff, it is a true collaboration of people from the community who make it all happen—it does take a village, and we invite all to join our arts family. VIE: What has been one of your favorite MKAF events in the past? MH: My favorite thing overall is being able to provide some of the same cultural privileges that I was afforded during my childhood to those who lack access to the arts. 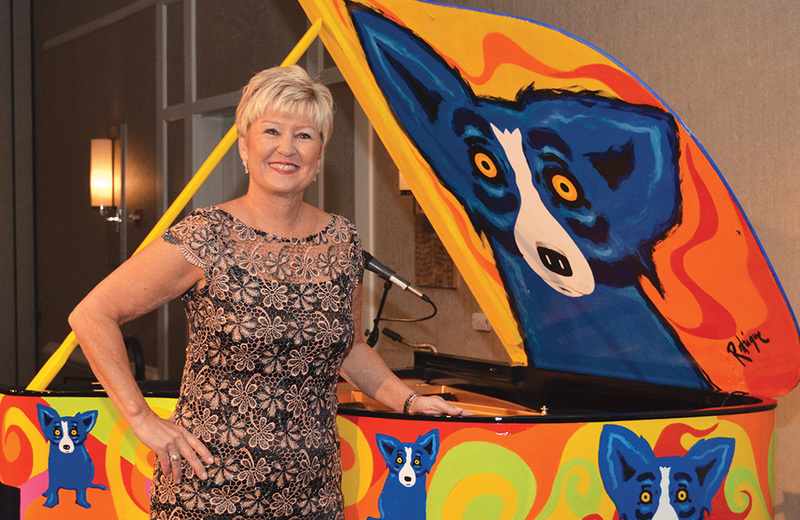 If I had to choose just one event, it would have to be the artist residency outreach with the late George Rodrigue, internationally renowned for his Blue Dog paintings, and his wife, Wendy. A weeklong student outreach inspired over 4,500 K–12 students with a live painting demonstration. Few people can say they observed a living master artist creating his craft from the first brushstroke on a blank canvas to the finished design. The Fountain City Players opened the 2017 Concerts in the Village summer series on May 4. VIE: How does MKAF plan to grow? MH: Since the 2013 capital improvement to develop seven acres to build the Dugas Pavilion and Village Green at the Mattie Kelly Cultural Arts Village, future development plans include the construction of a multipurpose indoor cultural center. Plans are to house permanent administrative offices, student and adult art labs, educational classrooms, gallery and meeting spaces, a state-of-the-art culinary kitchen, and a sculpture garden. As I tell my board, we already own the property free and clear; it’s just a matter of capital resources. This is not a private endeavor; this vision belongs to everyone who wants to be a part of Kelly’s legacy. VIE: Can you tell us more about the types of concerts and events MKAF hosts each year? Deb Nissley, Director of Operations: We produce fifteen musical concerts, a wine walkabout, a juried art festival (now in its twenty-second year), and numerous other outreach programs for children, special needs audiences, and wounded warriors. 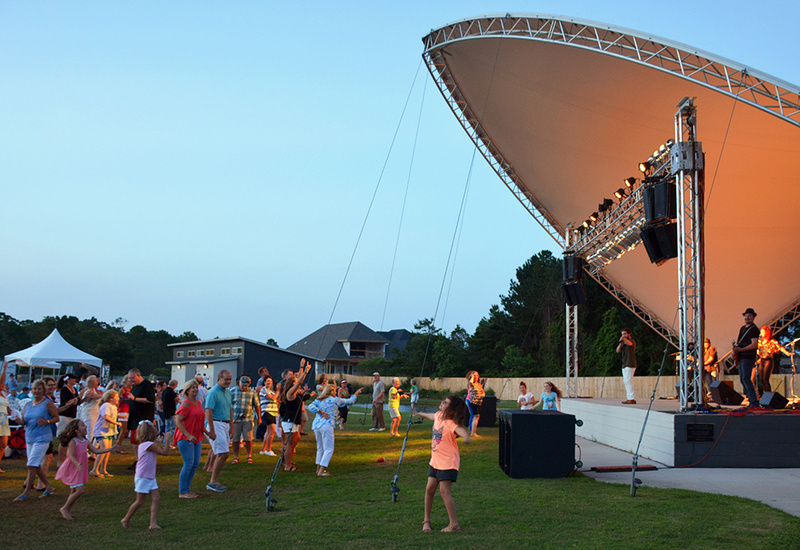 All of our concerts are held at Mattie Kelly Cultural Arts Village, a beautiful venue with a covered stage and seating for up to three thousand guests. Our Sounds of the Season Christmas concert is a holiday concert in collaboration with multiple churches in the local area, held indoors at Village Baptist Church in Destin. 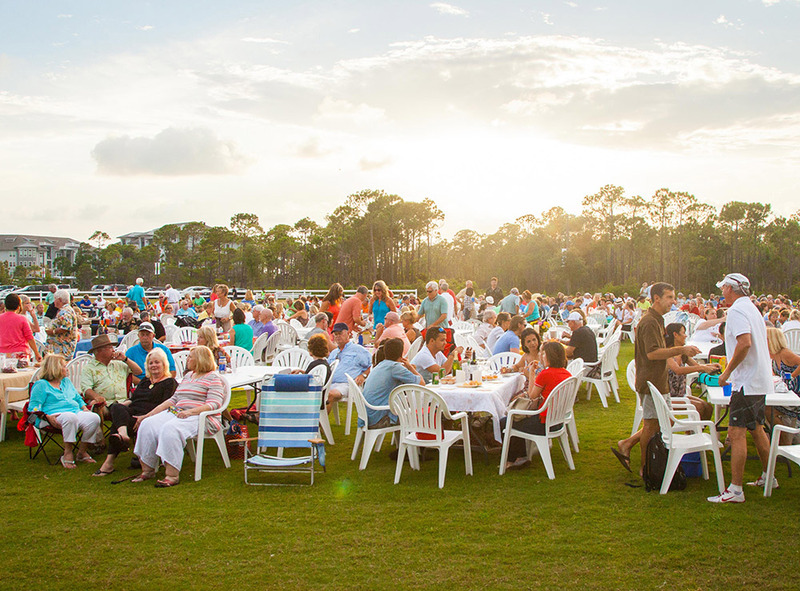 The Fall Wine Walkabout is an annual event hosted by Ruth’s Chris Steak House in Destin. In 2018, the Concerts in the Village summer series will extend to ten weeks, and we will expand the Concerts in the Village fall series to five weeks. 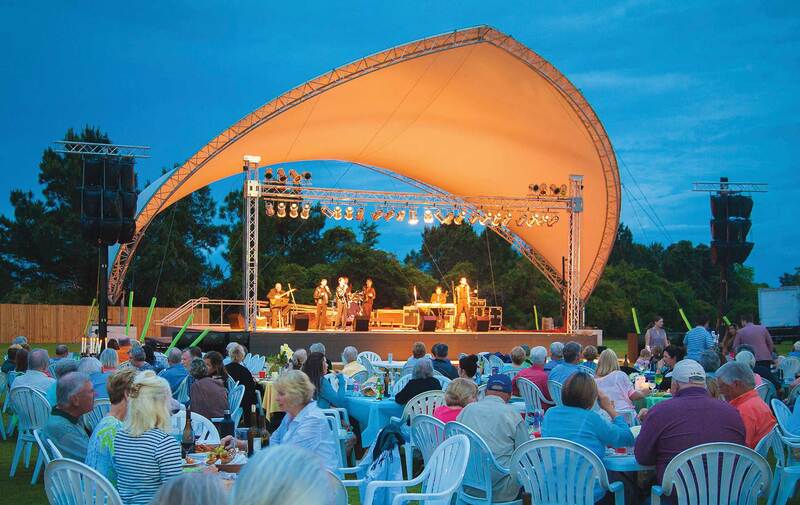 The concerts have become a popular tradition for friends, families, and businesses who love to come and enjoy a picnic and live music under the stars on Thursday evenings. The Festival of the Arts features a hundred juried artists, continuous live music, a children’s interactive art station, Cuisine on the Green, and a wine and beer garden. We like to say the Festival of the Arts is a celebration of art, music, food, and family fun. The Ruth’s Chris Wine Walkabout is one of our most popular annual fund-raisers. It includes a sumptuous array of appetizers and wine stations featuring fifteen to twenty wines. The raffle for this event features some exciting travel packages to destinations around the country and a popular Blind Wine Pull. VIE: What is your goal when choosing performers and shows for the MKAF lineup? DN: We have a dedicated concert committee that works hard to produce our incredible music lineups featuring the best local, regional, and national music talent. Our concertgoers love to dance, so a large number of the bands play fabulous dance music. Artists showcased at the Festival of the Arts are chosen by a group of impartial jurors based on the quality of their submitted images. VIE: What is the best part about working with MKAF? DN: I’ve been with MKAF for nineteen years. I love the events we produce and believe passionately in our mission. The most challenging part of working here is our limited staff during high event season. We deeply appreciate our dedicated board and corps of volunteers, who help make the magic happen. We also appreciate all our members; many people may not realize they can take part and support the community by becoming a member of MKAF, which is a great way to support the local arts and enjoy discounted pricing to our wonderful annual events. VIE: What types of programs are the staples of the MKAF educational mission? Melanie Moore, Director of Education: We love providing outreach programs that both educate and inspire! 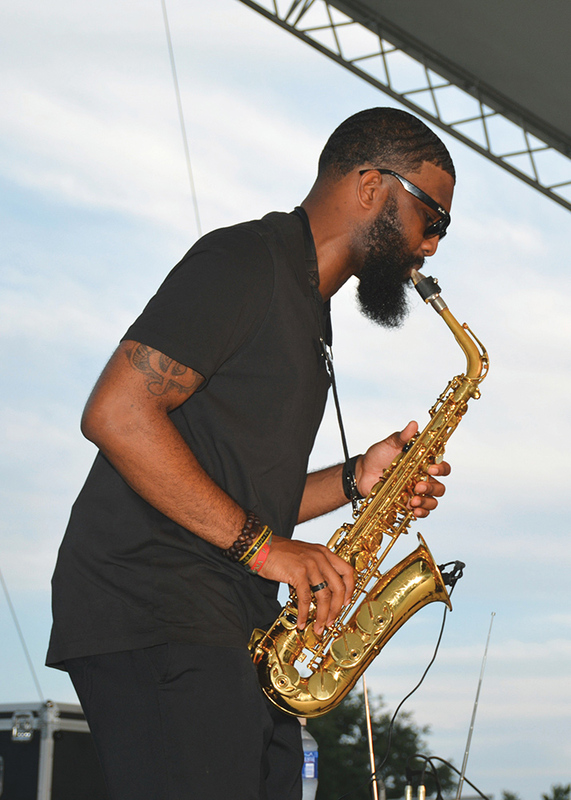 We serve over ten thousand people a year by taking national and regional touring artists directly to area schools, United Way agencies, and other partner nonprofits. One of my favorite programs is Hands On with Zig, which entails interactive performances and hands-on drumming workshops with Zig Wajler. Zig is a percussion and music education specialist who was featured on VH1’s Save the Music program, and who also does a fantastic job interacting with people who have special needs. VIE: What is the biggest goal for MKAF regarding education? MM: I think our biggest goal for community outreach is to bring more arts programming to those who truly lack access to the arts, including children and at-risk youth in rural and underserved areas. We have also made great strides in increasing programs for those who can reap the therapeutic rewards of the arts, such as children and adults with special needs. I also look forward to growing our Warrior Arts program to serve more veterans with both visible and invisible injuries. VIE: Can you tell us a little about MKAF’s partnership with area schools and other educational institutions? Are you affiliated with the Mattie Kelly Arts Center at Northwest Florida State College? MM: We are proud to be a proactive arts education partner with the Okaloosa and Walton County School Districts, the United Way of Okaloosa and Walton Counties, the Emerald Coast Autism Center, and military and veteran organizations such as AFSOC Warrior C.A.R.E. and the EOD Warrior Foundation. Plans are under way to collaborate with a new nonprofit called War Paints, founded by former Navy SEAL Rusty Noesner, which connects veterans and first responders with opportunities to create and sell their artwork. We also partner with the E.O. Wilson Biophilia Center for summer camps that feature art, music, theatre, and nature classes. Since its inception, MKAF has partnered with over seventy schools and agencies and reached more than three hundred thousand people. It is a common misconception that we are related to the Mattie Kelly Arts Center programs at Northwest Florida State College in Niceville. Though we applaud what they do to promote the arts in our area, we are not affiliated. The foundation is an independent nonprofit based in Destin. VIE: Why do you think this area in particular in so rich in arts and cultural education? MM: I think art enriches lives and that as this area grows, the demand grows for quality arts programs for all ages and abilities. Art is what unites us all and is something that makes us uniquely human. I think many people associate the availability of arts experiences as essential to their quality of life. Area nonprofit art foundations such as MKAF are investing more and more into area schools and their communities. It is a wonderful trend! VIE: We look forward to watching that trend continue to grow! Thanks to the MKAF and its partners for all you do. Learn more about the Mattie Kelly Arts Foundation, become a member, or view the calendar of events at MattieKellyArtsFoundation.org.